M. Puncekar Illustration: Draw a dog with eyes closed. Make something out of the aftermath. 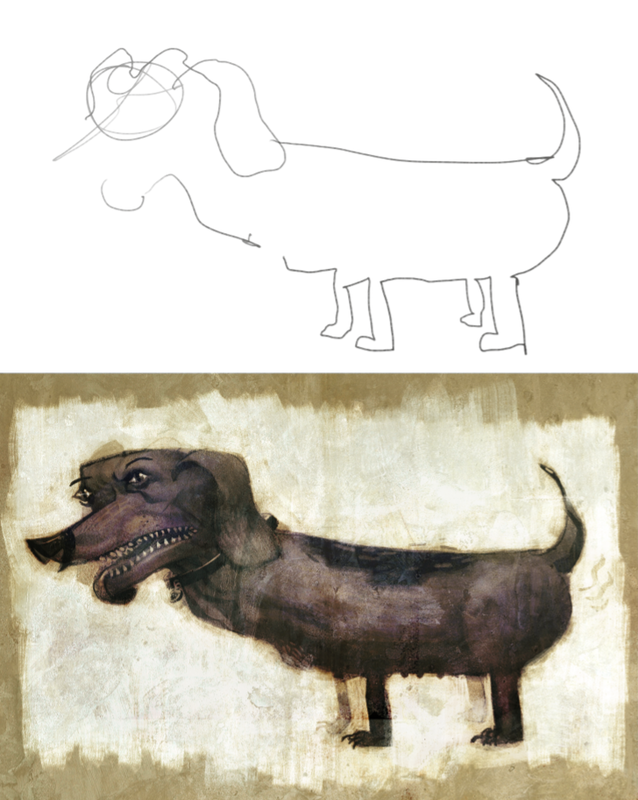 Draw a dog with eyes closed. Make something out of the aftermath. Wanted to take a break from some other things and saw this activity on a forum today. Like the topic title the challenge was to close your eyes and draw a dog. Didn't matter what breed or anything, but just a dog. I went for a wiener dog. The funniest and the best of all dogs. Here was my salvage job. To be fair, I was flashing back to Dave Devries Monster Machine drawings like crazy. Just so many similarities. Not that I would compare my effort to his stuff. Can we do something like this for the next sketch 2 Death thing? This seems really fun. I would like to do that. Yes. Considering my habitual lateness to the activities, if it's my call again, this is totally what it's going to be. Love it. All that understanding on top of spontaneity couldn't look cooler! you draw better then me with your eyes closed. Mike this dog is awesome--you did a fantastic job. A Jedi. All moody of course. Feeling a bit under the weather today.